The 9mobile Latest cheat is Unlimited, it works on android phones and can also be used on laptops or desktops and it can be powered with the use of Yoga VPN. 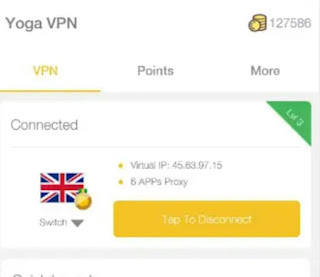 Yoga VPN has global proxy server (USA, UK, Australia, Canada, etc), it also protect your privacy and it’s a free VPN app. Click on ” Tap to connect”. That’s all , minimize the app and use the ADM trick to download Unlimited. This 9mobile (Etisalat) data cheat for July 2018 is suitable only for downloading and not for powering other apps.